The conductor Cornelius Meister is a fast-rising star in Europe. Having just finished a lengthy run at the helm of the Vienna Radio Symphony Orchestra, he is now the music director o the State Opera and the State Orchestra in the German city of Stuttgart. On January 30, Mr. Meister will make his debut at the Met. His task: conducting one of Mozart's finest and darkest operas: the deliciously twisted Don Giovanni. This week, Superconductor found time to sit down with the maestro to talk all things dramma giocoso. Written in 1787, Don Giovanni was Mozart's second collaboration with the librettist Lorenzo da Ponte. Hot on the heels of Le Nozze di Figaro, the pair conceived of a comic retelling of the life of Spanish libertine Don Juan. Don Giovanni also saw Mozart pushing the envelope, mixing drama and comedy in a way that no composer had attempted before. "Most of the opera takes place in the night, or inside rooms which are not so well lit," Cornelius Meister said. He is relaxed, conversational and friendly, having just conducted the dress rehearsal. "It's like making jokes in the dark." But it's that mixture of styles and tones that powers Don Giovanni. "Before I came to New York, I looked once again into my repertoire list. I knew this--but I was a little surprised--Mozart's operas areamong those operas that I've conducted seemingly every week." He adds "the productions are always different and when I was twenty-five, my musical approach was different. It also depends on where you are. Performing Mozart opera in a 4000-seat theater must be different than in a theater that seats only 200. The details are important but they are different. One of the most elaborate requirements Mozart makes is at the climax of the long first act, where the composer calls for three additional onstage orchestras to be playing three different dances at a party that the Don is throwing. Meister breaks it down. "They start the minuetto offstage, with an assistant who is watching me. It is in 3/4.The second group is then onstage playing a contredanse which is in 2/4. And then there is a Deutsche tanze in 3/8." He is quick to point out that the moment is much more than a musical joke. "In Mozart's time, every dance was connected to one part of the society. The minuet is for the nobles. The 3/8 dance is for the peasants. It is the third orchestra and the fastest one that Leporello (the Don's servant) is using to distract Masetto. Mozart noted in the score who is dancing with which orchestra." "Nowadays, we are used to listening to operas written two hundred years ago. But no one would have done what Mozart did in the Act II finale (where an onstage band briefly plays excerpts from other operas and even a bit of Figaro.) "It's interesting nowadays, I thought what would happen if the onstage band played rock? Or contemporary music--something modern from 2019? This is a good example for explaining how different audiences were in Mozart's time." 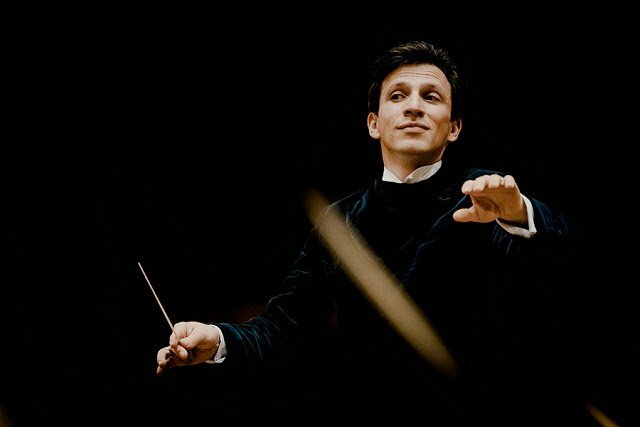 "As a conductor, I live these dramas while I conduct them. It's upsetting when I see people dying onstage in front of me. This opera starts with a murder! I see it happen some feet in front of me, and every time, it moves my heart. At the climax of the last act, the statue of the murdered Commendatore comes to a dinner party to drag the Don down into the fires of Hell. "In this production, from where I'm standing, the statue always looks a lot like (composer) Franz Liszt", Meister says. "I'm always afraid of him and I feel this icy hand behind me, right at the back of my neck." The Don's fiery end originally brought down the curtain on the opera, but the composer and the librettist added an epilogue for the surviving characters. (The Met production uses the second ending.) "We play the last scene," the conductor says, "and we have it as it is in Mozart's other operas. It's not clear how the relationship between Donna Anna and Don Ottavio will continue--they say 'let's wait another year' and it's not an end--it's the start of something. Elvira says, 'I'm going to the cloister.' Leporello says: 'I'm going to the pub!' (Reprinted by permission from Superconductor).